Don’t you love Paneer? Don’t you just love that chewy goodness called Paneer, a close cousin of ricotta and just the perfect replacement to meat in most dishes that roll out of a Tandoor kitchen? Um, I don’t like it all that much. True story. But when I was young(er), I used to have dreams about devouring huge amounts of Paneer Butter Masala and Paneer Tikka and miraculously escaping the indigestion that was sure to follow. That phase passed and fortunately-erm, for Kishore, really- I make Paneer exclusively for him these days. 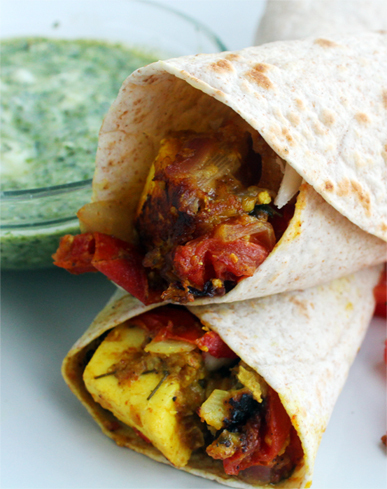 Paneer Tikka is one of those appetizer dishes that holds a permanent place on any Indian restaurant menu. It is a breeze to make (without the Tandoor, of course), an ultimate favorite with the hub and my round two recipe for a frozen piece of Paneer that was sleeping in the freezer. I cooked it in the oven and finished it on a pan because with a sleeping child in the house on a scotching Alabama summer day, the broiler was something I wanted to avoid switching on. Whisk together the ingredients for the marinade. Marinate the Paneer for two hours. Preheat oven to 400°F (200°C). Lay the Paneer pieces on a foil lined sheet. Dunk the veggies in the marinade and lay them out. Bake for twenty minutes. 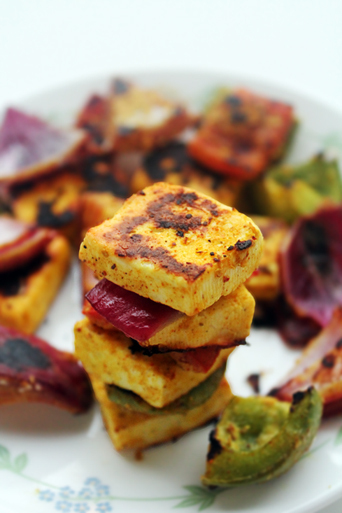 When done, heat a pan, transfer the Paneer and the vegetables and toast till brown on both sides. Serve with green chutney. 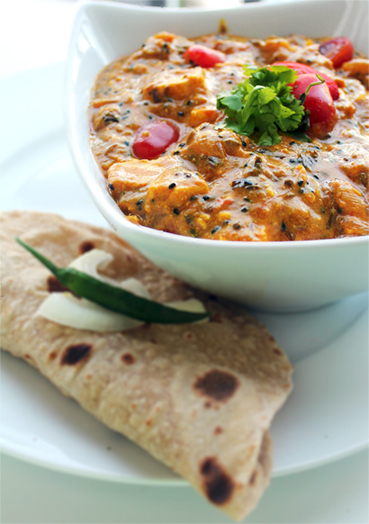 Categories: Childhood, Food, Indian, North, Recipe, Tandoori | Tags: Childhood, india, paneer, tandoori | Permalink. After five months of waiting, mommy is finally here! She landed a day before Mother’s Day and although I don’t really believe in compartmentalizing my love for mothers into one single day, it felt good to have her here right on time. Anyway, after showing her around this part of the town for a few days and taking turns at the kitchen, it was my turn to cook her up something interesting for a change. It was Friday after all! Lately, I’ve been obsessed with making wraps for dinner. I know I haven’t shown any proof for that claim but these wrap situations always happen on Thursdays. Since K and I have been attending birthing classes on that day, I discovered that a wrap or a burrito is the most convenient snack to grab and go when you have exactly ten minutes to take a shower, get changed and get going. But it was a Friday, we were done with those classes and I wanted to make something different for mommy. I mean, how many ways are really there to make brown rice in, right? I found these low-carb, whole grain tortillas in the store a few weeks ago and have been buying them regularly since my low-carb diet began. To cut the long, winding story short, I made Paneer Kathi Rolls for dinner. This dish is a great way to stretch a slab of precious Paneer and if you have ever been to Oxford Bookstore in Madras and dropped into their Cha Bar, the beautiful cafe dedicated to Chai and snacks, you would have probably tasted their Paneer Kathi rolls and fallen in love with it. If not, no big deal because as delicious as these rolls are in the cafe, it is pretty easy to make ’em at home. Mix all the marinade ingredients. Add the Paneer cubes and let it rest for half hour. Meanwhile, thinly slice the onion, and wash, de-seed and dice the tomatoes. Heat the oil in a pan. When hot, add the onion and cook it on medium until translucent. Add the tomatoes and the marinated Paneer (and the remaining marinade) to the pan and let it cook until the mixture dries up and the tomatoes are mushy. To save the integrity of the Paneer, resist tossing it too much. When the stuffing is dry, switch off the heat. Finely slice the cabbage now. The beauty of this dish is the uncooked cabbage that acts as a bed of lettuce. Heat the tortillas. spread them lightly with cabbage. Spread the Paneer mixture in the middle. Top it with the chutney and roll the tortilla as you would a burrito. Take a bite and tell me if it ain’t wonderful! Whisk everything together in a blender. Add water if it is too thick. The Chutney should be of a thick consistency but not so thick that it refuses to let go of the spoon. You could call it an Indian Tzatziki if you wish to. Categories: amma, Chennai, Food, Low Carb, Project, Recipe, Snack, Uncategorized | Tags: Cha Bar, low carb, mommy, Oxford Bookstore, paneer | Permalink. My quest for making good quality pizza started the minute I watched Bobby Flay toss that pie on his barbecue grill one sleepy winter day. It was an old episode of Boy Meets Grill and Bobby was grilling away with the finesse only a well-seasoned chef is acquainted with. This time, instead of watching the pizza (topped with everything meat, signature Flay) sizzle, I realized that I must try baking a pie. Its been ten months since I watched the episode and I am proud to say that I am five Pizza Pies old. Anyway, Monday was a cold day, huge surprise! My pizza base dough (courtesy Giada De Laurentiis) had been basking in the refrigerator for two days. Hence, it was only natural for me to bring it out and bake that pie. 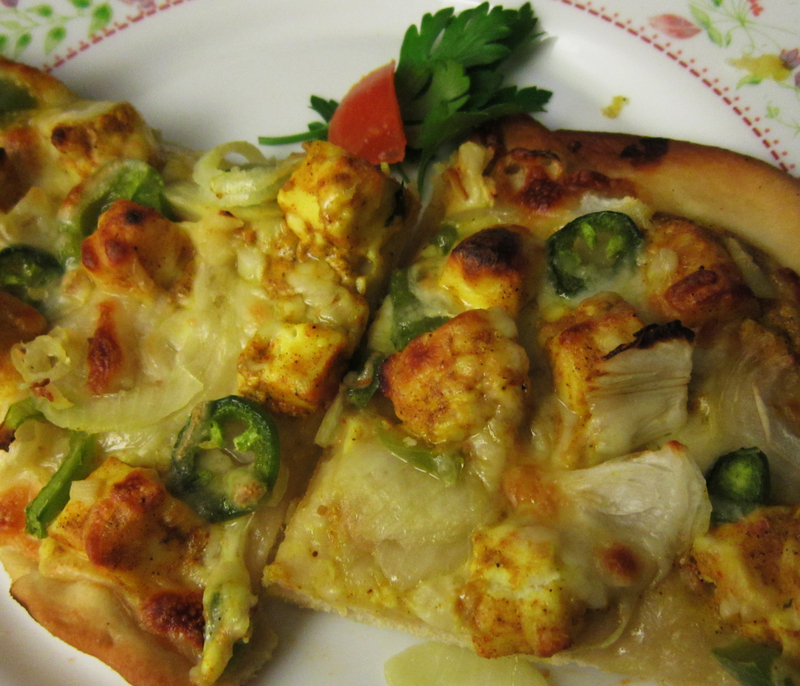 I had some home-made Paneer (cottage cheese) in the pantry which I marinated, in homage to the Paneer Tikka pizza we used to order back home from Pizzaurant, Chennai: the best Pizza place in the city. So I started by marinating the Paneer in curd, a pinch of salt, a tablespoon Garam Masala, a teaspoon Chili Powder (cayenne pepper will work) and a teaspoon turmeric powder for two hours. Next, I chopped one small onion, half a bell pepper, half a Jalapeño and grated two large bulbs of garlic. I then rolled out the base on a well-oiled and flour dusted pizza pan. 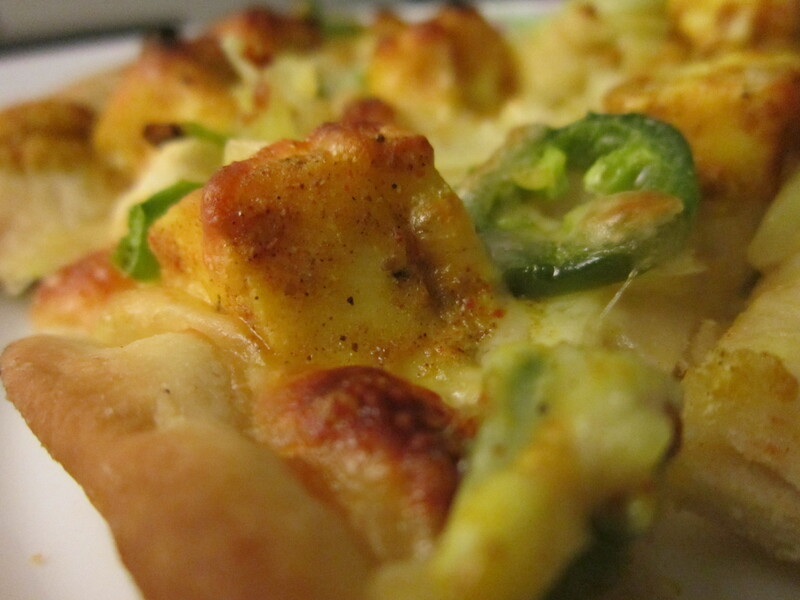 After this, I added some mozzarella cheese to the pan, arranged the marinated Paneer, onion, bell pepper and garlic. I topped this with some more cheese (it may seem like I used a lot of cheese but in reality, it took less than half a cup to make this pizza delicious) and finished by sprinkling some salt, red pepper flakes, oregano and a drizzle of olive oil. The pie went into a 450 F (230 C) pre-heated oven for 15 minutes and came out bubbly, crispy and completely beautiful. Categories: Food, Recipe | Tags: bake, Bobby Flay, Giada De Laurentiis, jalapeno, marinate, oven, paneer, pie, pizza, pizzaurant | Permalink.